We eat a lot of eggs. My recent Spinach and Tomato Crustless Quiche was impressively easy so I decided with a recent gift of fresh basil from a friend whose basil is still in production, I'd be quite happy to make the same dish substituting basil for the spinach. Easy, delicious and easy to re-heat in the morning for a satisfying breakfast! In a large skillet, saute half an Onion and a couple cloves of minced Garlic, add a couple of handfuls or roughly 1 cup of fresh, chopped Basil. Once Spinach is wilted, throw into the bottom of a well greased round cake pan. Top with slices of tomato and a sprinkle on some mozzarella cheese. 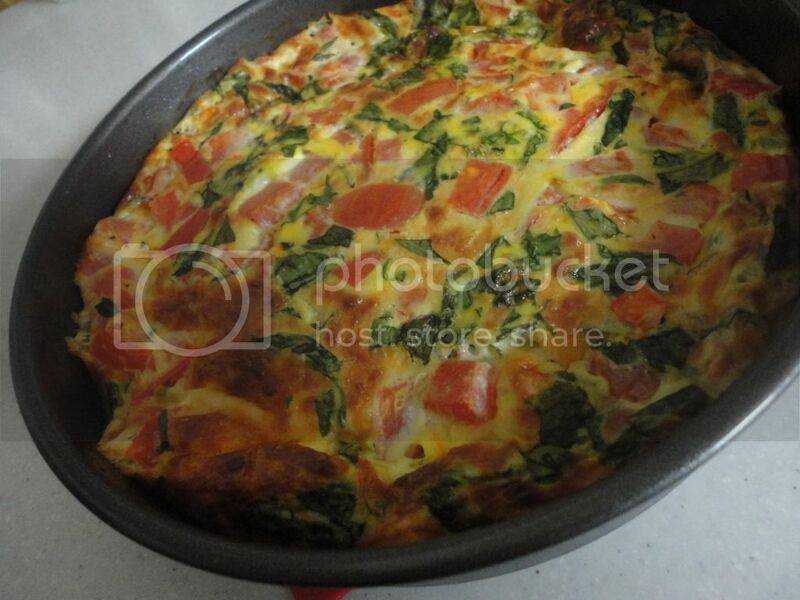 In a separate bowl, whisk together 6 eggs with 1/4 cup milk or yogurt, season with salt and pepper, pour over Spinach. Top with grated Parmesan and bake at 350F (177C) for 20-30 minutes or until egg mixture is set and top is beginning to brown.